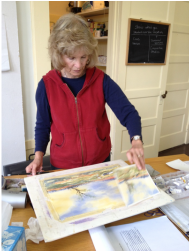 Watercolor classes this spring semester continue at the Willits campus of Mendocino College. In the fall I will be teaching again in Willits. Classes begin August 19. I continue teaching in Willits for the spring semester 2020. Classes are Monday/Wednesday 2:00-5:00 pm. Being in a painting class always makes you more aware of the beauty that surrounds us. There are Beginner & Intermediate/Adv. skill level sections. These are mixed level classes, but all levels always learn a lot from each other, and everyone will receive personal attention. We will explore many techniques from wet on wet, to glazing and mixed media. There is no experience necessary in the beginning section; we will work on color, form, personal expression and developing skills. Classes are being held in Classroom 1, behind the museum on Commercial Street. Park in the library parking lot and go through the gate. Negative painting is a technique that adds depth, dimension, interest and mystery to a watercolor painting. If you are new to Negative painting, but have experience in watercolor, Part 1 is the class for you. Negative painting is painting around the positive shapes with glazes to make the shapes stand out. You start with a drawing, paint over it with a loose underpainting, let it dry, and then begin to "carve out" your subject matter by painting around the positive shapes. This process will have you looking at painting in a whole new way, bringing freshness and a whole new dimension to your watercolor. Simple exercises and clear demonstrations will teach you the techniques to make Negative Painting easy to understand and accomplish. *Part 1 is suitable for painters with watercolor experience, and more advanced painters who want to refresh their Negative painting skills. Handouts included. *Part 2 is suitable for those who are continuing their studies from Part 1, or who are experienced watercolorists. We will explore various types of under-paintings, lifting out shapes, and using opaque watercolors or gouache to reclaim the light patterns. Take your painting to the next level! Handouts included. I think watercolor is the perfect medium to use in painting birds. It will accurately portray birds and animals, it is great for detail work, and it is wonderful for the landscape portion of the painting. Each bird is unique, and we will use watercolor to capture what qualities makes them special: Their distinctive colors, their beauty and their personality. I will have sketching suggestions for you, how to work from life and also from your photographs. We will try several techniques: A loose style bird portrait, a more realistic watercolor portrait, and add black ink, colored pencils and watercolor pencils for detail work. Through demonstrations I will guide you through this process. I will provide sketches and photographs for you to trace; also please feel free to bring your own. At the end of the workshop you will have many techniques to use for future bird paintings. DURING KID'S ART CAMP THE WILLITS CENTER FOR THE ARTS IS FILLED WITH CHILDREN doing movement and singing songs, creating art, working with each other, and having fun exploring new art materials. The students ranged from age 7 to 15. "To have a whole week of mornings devoted to art is such a great experience." Watercolor painting, chalk and oil pastels, ceramics, paper mache', silk painting, creating glass magnets and exploring the art of the Great Masters are the art projects the children will experience. All materials are included and a healthy snack is provided. Children will be grouped according to age, and I will have an assistant. BE A KID AGAIN, AND EXPLORE THE WORLD OF ART, WITH A NEW PROJECT AND NEW MATERIALS EACH DAY. We will have a whole week of mornings devoted to art including: Watercolor painting, chalk and oil pastels, ceramics, silk painting, creating glass magnets and exploring the art of the Great Masters. I will provide all the art materials including hot and cold beverages and snacks. Come and join me for lots of fun as we complete a new project every day and have fun being with each other! IN THE WALDORF SCHOOLS THE WATERCOLOR PAPER IS SOAKED IN WATER, THEN LAID ON A BOARD AND PATTED TO DAMP. THEN WATERCOLOR IS APPLIED. I have taught this process for years, and would enjoy sharing it with you. The colors flow on the damp paper, blending into one another in beautiful, unexpected ways. There is a softness to the paintings that cannot be attained any other way. We will do several paintings, and I will talk about painting verses, curriculum based projects, and age appropriate artwork. I will also share how to make it a successful experience for the teacher and the young artist. Suitable for parents, teachers, homeschoolers and any other adults interested in this beautiful technique. All materials & handouts included.